To explore and enjoy the authentic Cuba, we offer you different kinds of tailormade travels from selfdrive, grouptravel, individual travels by regular bus and/or taxi, family and scuba diving holidays, with at all places English speaking local guides waiting for you, from daywalks and trekking in the mountains to biking adventures. These offers are some sample itineraries (see next tab for some of the itinery details) of a much wider variety of possible tailor made travels on Cuba. Contact us with your special travel wishes. ﻿With everything taken care of, just pop your kids and your bags into the car and go. As the itinerary is tailor made, there are no age limits; bring your toddler - and his granny. Cuban culture is particularly welcoming to children, you may find your kids end up learning more Spanish than you! There are guided walks, and horseback rides, waterfalls and boat tours - and free time factored in for building sandcastles on the beach. You'll also have the peace of mind that assistance - if needed - is just a phone call away. Find related sample itinerary in the next tab. Our top tip:Homestays are recommended over hotels - particularly if you request to stay with families with children of a similar age to yours. Meeting the authentic Cuba, with activities as walking in the mountains, beach life, salsa classes, horse riding, snorkelling, diving, catamaran trip, nightlife and learning Spanish. 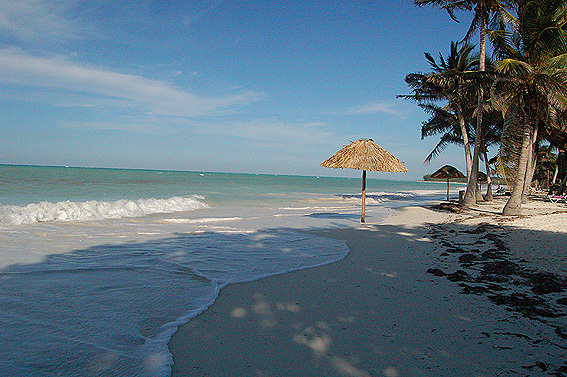 Cuba is a beautiful island surrounded by sandy beaches, coral reefs and blue waters. It has a very specific vibration of its own - the Cuban people show a playfulness and a joy which is remarkable. They celebrate life with humor, love and passion. The nature on Cuba is still very pure, the people a discovery, which make Cuba the most interesting destination of the Caribbean. Roundtrip over Cuba from West to East, with expert tourleader and mainly with private taxi transfers, staying in boutique homestay in Havana at beginning and end and the rest local casas particulares to connect with the real Cuban life. Private Minivan transfers with your own driver have as great advantage that we will make beach & snorkeling stops along the way, that we can enjoy more of the real Cuba and that we have more freedom than with a regular bus trip. We drive eg. via Bay of Pigs where buses drive over the highway. This is a holiday of 19 days traveling from West to East Cuba with your tourguide. Departures can be on any day with a min of 4-6 pax, with the travelparty organised by your own. It is a roundtrip out of thousands where you can still see and experience the authentic and sensual Cuba before it is too late to experience it as it is. You are taken into the real Cuba by your tour guide, meet locals on our day walks, excursions and we will enjoy the Cuban nightlife with salsa. We go one day in the mountains at Sierra Escambray to have the experience of being fully in the subtropical Cuban nature and see the local coffee culture. In Baracoa we will visit local farmers and their cacoa and coconut plantations while we walk through the amazing landscapes. Daywalks are easy and only when there have been tropical rain showers the paths in the mountains may become slippery and the level may change from easy to easy/moderate depending on your walking skills. This itinery or an adapted version is also possible for 2 persons (or more) in selfdrive format, with or without a guide, or with a guide and driver, all with local guides waiting for you at each location. Extra activities are organized by your tour leader as salsa classes, horseback riding, gourmet dinners at the best paladares / restaurants with the best lobster, mojito or veggie foods, cooking classes and going out at night, it will be an amazing Cuba holiday. You may improve your Spanish at the same time as you will have plenty of opportunities to chat with the locals and homestay families. Your tour leader has guided around 40 trips over Cuba the last 12 years and is an expert on nature and culture of this fascinating island in the Caribbean. 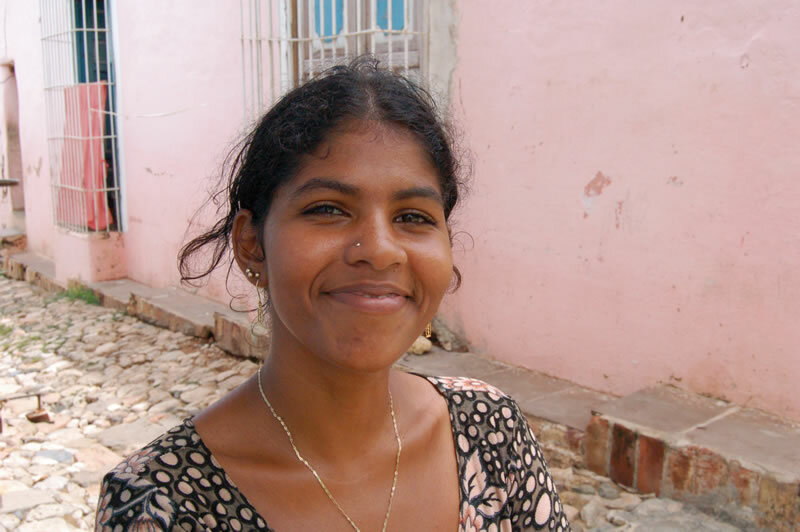 Cuba has become like a family for your guide and it is not unlikely that you might experience the same. 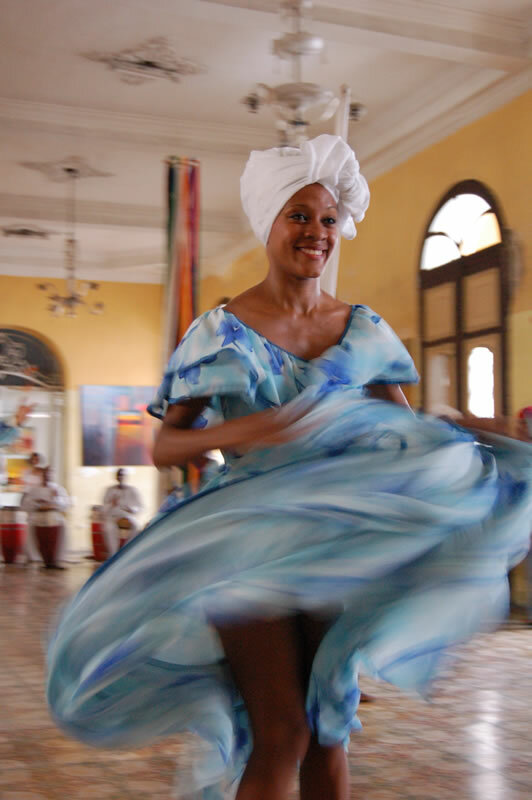 It is a special opportunity to travel with your guide and to be invited to take part in the Cuban rhytm and musica cubana on all parts of the island! This trip is for all ages from young to old, families with children, couples and singles alike. We have several free moments and the program can always be modified to specific needs and wishes on location between the traveling moments. This trip is mostly with private minivan taxis but can also be done all in style with classical American cars out of the 50's on one stretch of the itinery or through the whole of Cuba ! The quote will have to be adapted then a little as only 3 - 4 persons enter in a Vintage car with luggage. In case of a specific request for a tailor made Grouptravel the itinery can be made according to the travel wishes of the party involved. Holiday extensions with beachlife and/or scuba diving before or after the trip are possible at eg Maria la Gorda, Isla de Juventud, Varadero, Havana, Cayo Santa Maria, Cayo Coco or Cayo Largo. This trip or an adapted version is also possible as individual holiday for 2 persons (or more) as selfdrive, travel by taxis or by regular bus, all with local guides waiting for you at each location. PREMIUM TRAVEL: same or different itinery with a PRIVATE GUIDE - DRIVER, please contact us for a chat on Skype or Viber and ask for a quote. We can also organize a Coast to Coast 10, 12 or 15 day Cuba trek through the Sierra Escambray with boutique hotels and/or casas particulares at start and end. This Cuba trekking can be undertaken as a charity challenge. 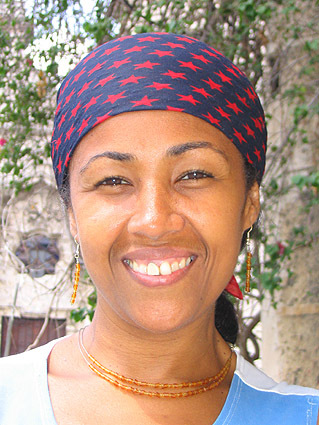 Further we can offer Spanish courses in Havana, learn Spanish in Cuba’s capital which offers everything from museums to art galleries, salsa clubs, friendly and humurous people as well as a natural beauty of beaches around, group classes or private classes with licensed teachers, can be combined with private salsa or drum classes and great homestay linked to famous salsa school. Most common travel options on Cuba for individual travelers are: 1) selfdrive with rental car, 2) travel by bus Viazul / Transtur with use of local taxis, 3) all transfers by private taxi transfers (for larger travelparties up to 7 persons these are with minivan taxis); it is possible to have a guide traveling with you all the time in this way but this is not necessary as local guides can be arranged waiting for you at all the locations of the excursions, this depends on your preferences; some larger trajects can be done by regular bus if requested to save on costs; further on some trajects we can arrange taxi transfers or day excursions with American Vintage cars, 4a) rent your own car and have a private guide as guide - driver, or 4b) rent your own car, drive yourself but accompanied by a guide. All guides who accompany you on a travel are official licensed guides. When you travel with a guide all costs for meals, drinks and accommodation of the guide are included in the quotation, only tips come extra. We offer tailor made travels for Cuba, Colombia, Panama, Bolivia, Brasil, Peru, Ecuador with Galapagos, Chile with Easter island and Argentina. Contact us for a chat via Skype or Viber and ask for a tailor made itinery and quote. Find related sample itinerary in the next tab. For more than 120+ (!!) independent reviews on individual tailor made trips to Cuba of the same operator as this grouptrip: look for Cuba Tours on this website of Responsible Travel or contact us directly for a Skype meeting. You'd have to be loco to come all this way without discovering some of Cuba's other treats, however, so the tour continues - by rental car, taxi or bus as you prefer - taking in iconic cities, bucolic landscapes and seductive Cuban culture. Throw in a catamaran excursion, a tobacco farm, a mountain trek and some communist history - and that's Cuba all wrapped up. Find related sample itinerary in the next tab. We also offer Sail Diving programs in Cuba to the Canarreos islands & Cayo Largo with Sail Tomorrow on a beautiful yacht liveaboard with professional crew departing from Cienfuegos. Programs with diving are 7 days, for guided sailing without diving can be 4-7 days. Our top tip: Stay in casas particulares (homestays) where possible - you'll get a wonderful insight into Cuban life, and make firm local friends. ﻿As the enormous number of glowing reviews reveal, this is our top selling Cuba tour. Tailored ot suit your tastes and budget, this is Cuba as you want to see it. Cuba has national parks and wonderful rainforest and mountain scenery - make the most of it with a guided trek, horseback ride or cycle. Explore its underwater treats with a scuba diving or snorkelling excursion - or try rafting or fishing. For some classic Cuban culture, try a salsa class or a Cuban cooking lesson - or request tickets to a top show at Tropicana. The company will take care of all your bookings - and be just a phone call away should you need any further support when on the island. Find related sample itinerary in the next tab. Our top tip: Homestays are not a good way to meet locals, they're often nicer than hotels, with tasty, homecooked food. We have developed a cultural exchange program for choirs that wish to participate in the International Festival de Coros of Cuba at Santiago de Cuba. The program is suited and quoted for a large world choir of 60 - 80 persons but can be adapted and tailor made for much smaller choirs as well. Just an example that we can take care of big events with larger travelparties as well with our excellent team in Havana or elsewhere in Latin America. Feel free to Contact us! Arrive in Havana, meet host and transfer to Hotel Raquel, a nice, boutique hotel in Old Havana 4 stars. Can also be hotel Sevilla with swimming pool, or a nice boutique homestay / casa particular with 3 - 4 rooms at 3 minutes walk from the Sevilla hotel. Walking tour of 3 hours especially designed for children, through the old city with a local guide. 2 hour tour in American classical cabriolet through Havana, including a visit to the Plaza de Revolucion, the best icecreams in Havana in Coppelia, and opportunities for the children to take photos at beautiful places with big fig trees or overlooking the Atlantic ocean with the cars on the background, as the children like. Optional: evening excursion to Havana fort for the ritual of firing of the canon (canoñazo) over the bay of Havana at 9 pm. Pick up rental car with your host. Drive to Viñales and check into hotel Ermita / hotel Jasmines, with a beautiful view over the valley and swimming pool. Free afternoon for play & relaxation. Homestay is at quiet valley with view from terrace into valley and great homecooking. Small hike of 3 hours with small group through the valley. Visit farmer families and see something of the tabaco culture. In the afternoon there is time to cycle, or to visit the most beautiful cave open for public in Cuba, Cueva San Thomas. Is an adventurous walk through the cave, lovely for the children. More options: full day hike with parkranger, visit on horseback cave with waterfall, or garden at an organic farm with best view over valley. Early morning departure to arrive on time for boat at 10am to the tropical island of Cayo Levisa. Full day for beachtime and possibility to embark for a snorkel or diving excursion. Departure boat from island at 5 pm, return to hotel / homestay in Vinales. Soroa / Terrazas. Drive to the special tropical surroundings of Soroa, check in hotel Soroa / hotel la Moka at las Terrazas, both have swimming pool. Homestay is in mountains of Soroa at art family, quoted is hotel la Moka. Free day at Soroa or las Terrazas. Time to visit orchid garden, waterfall, and walk through the tropical forest to the viewpoint of Soroa from which you can see the Caribbean sea. Full day private guided Wizards walk, off the beaten path through the tropical hills and forests around Soroa, some fruits & coffee at a coffee farmer and have a lunch prepared at a farmers house in the middle of the forest. At the end you may visit a small mountain school and bring some donations with you if you wish. Drive to Trinidad via eg Bay of Pigs, with a stop to swim & snorkel in the crystal clear bay and the Cueva de los Pesces. You stay in an all inclusive beach resort Trinidad Brisas del Mar, 4 star all-inclusive, on the Ancon peninsula at the beach. A coral reef is nearby to explore by snorkeling. You can also stay half of the time in homestays at Trinidad village with Cuban families and half of the time in a beach resort at Ancon beach. We can ask for homestays with families with children of the same age. Free day to enjoy swimming & snorkeling on the beach at Ancon and with activities for the children at the resort. Mountain excursion, Sierra Escambray to hacienda Gallega with the Tarzan water program. You drive to Topes Collantes and pick up your private guide in the mountains. Visit of coffee hacienda. Depart by truck from Topes further into mountains to hacienda Gallega. With 1-2 hr walk to a high waterfall from where the children start descending with your private guide along the river through tropical surroundings by swimming, gliding and walking up to Deer lagoon in about one hour. Afterwards, walk back to the hacienda (1hr), where a late lunch will be waiting for all of you. At midday back to Trinidad again, first by truck to Topes Collantes, then by your own car to Trinidad homestay / resort. Full day Catamaran excursion to tropical island Cayo Blanco including snorkeling along coral reef, beachlife, time for exploration island with fish lunch. An easy day for complete relaxation for the parents, at least on the boat! Catamaran excursion to Cayo Leguano with tree rodents and many iguanas is also an option but is further away and usually too long for children to be on the boat. Free day. Optional: drive to Valle Ingenios with visit to slave bell tower Iznaga, followed by horseriding at a remote countryside hacienda for 2-4 hrs, including lunch in a restaurant or in the open field. They have smaller and tame mules for the children that can be specially requested. You can walk or ride or both. Other option visit waterfall El Cubano by walking or horseback riding from Trinidad. Free afternoon at beach.Day 14:Travel back to Havana eg over Cienfuegos, Santa Clara to visit the Che Guevara memorial, or the Pigs Bay again, drop off car. Check in at the famous hotel Nacional de Cuba, 5 stars with swimming pool and sea view from the garden. Free morning Havana. Time to visit the Partagas cigar factory, see the periscope of Camera Obscura or go shopping for souvenirs at the handicraft market. Transfer out for international flight. Cuba holiday, small group tours. Travel like a local. We offer tailor made travels for Cuba, Colombia, Panama, Bolivia, Brasil, Peru, Ecuador with Galapagos, Chile with Easter island and Argentina. Contact us for a chat via Skype or Viber and ask for a tailor made itinery and quote. Arrival Havana, reception by host, transfer with private taxi to boutique homestay / 4 - 5 star boutique hotels as hotel Raquel, Florida, Ambos Mundos, Conde Villanueva all in Old Havana and hotel Nacional de Cuba in Vedado. Explore Havana. In the morning private guided walking tour through the old city center of Havana. In the midday excursion of 2 hrs with classic American cabriolet through the city visiting the Faro (lighthouse), Russian missiles of 1962 crisis, Malecon, Miramar, Plaza de Revolucion with a Coppelia icecream in Vedado or visit Fame of hall at Nacional de Cuba hotel. Viñales. Pick up rental car and drive to your homestay with a Cuban family in Viñales or hotel Jazmines. In midday half day group guided walk through the valley of Viñales and experience the tobacco culture. Maria La Gorda. By car to Maria La Gorda, the best international scuba diving center of Cuba, and the 4th best diving center of Latin America. You stay in a room with seaview if requested on time, hotel Maria la Gorda. Diving. Three days full for diving sessions, snorkeling and beachlife. Included in price are 2 diving sessions during the day, total 6 dives pp. Night diving sessions are optional. Optional diving at nearby Cabo de San Antonio and excursions visiting the National park Guanahacabibes. Soroa & Las Terrazas. By car to Soroa and stay at boutique homestay of an art family or to Las Terrazas and stay at the boutique hotel la Moka (with swimming pool), beautifully integrated with nature and considered as the most beautiful hotel of West Cuba. At Soroa you can walk to the viewpoint, waterfall and orchid garden. Explore mountains Sierra Rosario at Soroa. Wizard's trail, a full day private guided excursion through the tropical mountains of Soroa with lunch at a farmers place in the middle of the tropical forest, visit to a small school in the mountains included, homestay or hotel la Moka. Bay of Pigs, Zapata Peninsula. By car to Playa Larga, with a dive in Pigs Bay included at Cueva de los Pesceswhere you also have a cenote and a restaurant for lunch. Overnight in hotel Playa Larga or Giron, or at a homestay / casa particular Playa Larga directly at the beach. Morning dive at divecenter Caleta Buena - Playa Giron included. In midday to Trinidad via Cienfuegos, boutique hotel 4 star Iberostar Grand hotel or nice homestay with terrace and view. Optional cultural guided tour at Cienfuegos. Salsa classes can be arranged all day via our homestay coordinator and our teachers list. Dive at Trinidad Ancon beach with catamaran and 2 dives pp included. Diving zone near to Cayo Blanco, boutique hotel / casa particular downtown Trinidad. Sierra Escambray. Excursion into the subtropical mountains of Sierra Escambray. Drive with your own car into mountain, pick up private guide at Topes Collantes, enjoy delicious cup of coffee at hacienda, and then on foot deep into mountains to hacienda Codina. Along the way side excursion to open cave La Batata with swimming and some climbing. On the hacienda you will have a typical lunch. And after lunch you make an easy roundwalk through the orchid garden, visit a bat cave, viewpoint and bamboo garden. Very nice place to be. In late midday back to Trinidad again by truck out of the mountains, and later on with your own car. Alternatives, or for extra days: cultural tour Trinidad, full day Catamaran group excursion to tropical island Cayo Leguano - Cayo Blanco with snorkeling, beachlife, time for exploration island and fish lunch. Or: a horseback excursion of 4-6 hours in Valle Ingenios, Sugarmill Valley or half day to waterfall at El Cubano. Havana. Drive back to Havana, eg through the Sierra Escambray to Santa Clara and visit the Che memorial, drop off the car. Quoted are both boutique homestay up to 4 - 5 star boutique hotels as hotel Raquel, Florida, Ambos Mundos, Conde Villanueva and Nacional de Cuba. Free morning and part of the midday at Old Havana / Vedado, transfer out in midday to international airport with private taxi included, depending on flight schedule. You will be met by our agent on arrival on the airport and travel with private taxi to your hotel in Havana. Your hotel Park View (or a comparable hotel of the same level & atmosphere) is situated in the cosy centre of Havana near the Museum of the Revolution. Upgrades to 4 - 5 star boutique hotels as hotel Raquel, Conde Villanueva, Ambos Mundos, Florida, Sevilla, Nacional de Cuba, Iberostar Parque Central, Saratoga etc are possible. We also offer top boutique homestays / casas particulares and can quote for both options. These two days you can use to visit fascinating Old Havana, which has been adopted as Heritage of Mankind: stroll through the streets, go shopping for hand made clothes, visit colonial houses with large patios, the famous places of Ernest Hemmingway, Museum of Revolution, handicraft market and much more. You can also use one day to go to the beach a little further away from the old centre. A local English speaking guide and/or driver can be arranged for one or two days. In the morning you pick up your car in Havana and then drive to Pinar del Rio from where you continue to the spectacular landscape of Viñales. Your hotel La Ermita / Jazmines is situated on a hill & has a spectacular view over the valley of the “mogotes”. These are calcareous rock formations full of caves & hidden streams. Homestay with best view into valley and with terrace in Vinales is also possible. You will have one guided day through the valley of Viñales and experience the life of the tobacco farmers, the cultivation of tobacco, and see the “mogotes” , their caves and their peculiar ecosystems from near. You can visit a tobacco warehouse (despalillo) where the leaves are prepared and fermented, visit cave Santo Thomas, rent a bike, or go to the tropical beach of the island Cayo Levisa or Cayo Hutia for a day excursion. Today you drive to Soroa. You can visit a tobacco factory in Pinar del Rio, where the tobacco leaves are made into cigars. The province of Pinar del Rio is world famous for the quality of the tobacco. Homestay in the mountains of an art family, hotel Soroa or Hotel la Moka. Soroa is surrounded by tropical vegetation, the hotel has a large swimming pool and as soon as the night falls you hear the cosy sounds of beetles and glass frogs. You take a botanical walk with a local guide through the bio reservate of Sierra del Rosario. You can watch birds, visit the ruins of an old French coffee plantation, and take a stroll through the orchid garden or take a dive in the waterfall of Soroa at the end of the day. You drive from Soroa to Trinidad and if you want you can make a detour along the Bahio Cochinos or famous Pigs Bay. You can take a dive in the sea and discover all kind of fishes in an enchanting sea cave while the lunch is prepared. At the end of the midday you will arrive in Trinidad, one of the most beautiful colonial villages in Latin America. In the evening you can enjoy your dinner in a paladar and immerse yourself in the nightlife and salsa feeling of Trinidad. According to your choice you stay in one of the hotels downtown, near the village of Trinidad, at the beach of Playa Ancon, or with a Cuban family in a casa particular downtown Trinidad. Optional stay overnight at homestay at the beach in Playa Larga and/or at Cienfuegos and have a private guided citytour. Trinidad and its surroundings have great things to offer to complete your holiday. You drive into the steep mountains of Sierra Escambray and meet your guide to make a botanical walk through the tropical green mountains. You visit a botanical garden, the cave La Batata from where you can make a swimming excursion through the river flowing through an open cave, you visit a coffee hacienda and a hacienda where you will have lunch. From here you continue to an orchid garden, a walk through a cave with bats and a spectacular view on Trinidad and the Caribbean coastline. The other days you can arrange an excursion to go on horseback riding to the waterfalls & cave of Trinidad, go to the beach of Ancona or book with us for a full day excursion by catamaran to Cayo Leguano, snorkel around the coral reefs and enjoy the tropical beaches & mangrove forests. Your return travel to Havana evt via Sancti Spiritus and Santa Clara to visit the Che Guevara memorial. In Havana you deliver your car. You will stay again in hotel Park View (or any hotel of preference) or a top boutique homestay. We can quote for both hotel and homestay. You will be picked up at your hotel / homestay and have a private taxi transfer to the airport for your international flight.